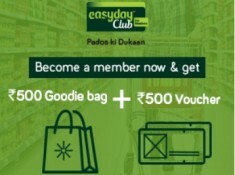 Easyday is giving you a big chance to Get Various benefits on Joining their Group, The Easyday Club Savings Club Membership is valid for 1 year or shopping spend worth Rs. 50,000, whichever comes first. Post this the validity of the card will have to be renewed. Now Get Milk at A Price of Water, Rs. 20 for 1 Ltr & Various Benefits. Note: Club Members will get Various More Benefits & Gifts on Certain Purchase Value!! Offer Valid Till Stock Last & May be Not Available on Select Locations, So Feel Free to Comment If facing Any Issue!! CASHBACK will be given within 7 days from the date of purchase in Future Pay Easyday Club Wallet and this cashback will not expire.